We use Actual Professional Fireman to safely move you! All of our firefighter movers have completed extensive background checks for your peace of mind. Firefighting's Finest Moving and Storage, Inc. is the premiere moving and storage company in Austin and the surrounding areas. 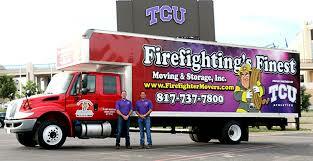 Operated by off-duty firefighters, you will Use Movers You Can Trust! These guys were awesome. Super fast and all pro. You won’t find more value, and the price can’t be beat. Hire these guys as your movers. You won’t regret it. Quintin Z, Josh T, Cory S and Jeremiah P were awesome. Great crew to work with, very courteous, flexible and were very efficient! Thanks guys appreciate your help!